Discount trips around the world! Sponser me for the RRR please! Where in the world is Gwen? I love that advances are being made. I can only wish for more. Of the concerns listed I am vitamin D deficient. The major issue that I believe set off my MS is severe major stress. It triggered the MS for sure (in my opinion), but what I do not know is if I already had the markers that left me more susceptible to this disease. Dealing with a disease that is not fully understood by the medical profession has its challenges. It will be 7 years next month. 7 years of living with the diagnosis of MS. I think I have been hospitalized 4 times. I think, it has been enough that I do not remember clearly. I finally realize that I have been putting myself in the hospital. Which really makes me wonder if the drugs that they have me on are doing anything for me. How do I put myself in the hospital you ask. Oddly it is by doing the things that we all know we should do or do more of and that is exercise. For years now I dread the coming of summer. The heat is overwhelming. It exacerbates all of my symptoms, even some I rarely experience. Even looking at my posts over the last few years I have only written in winter. I have always been busy. I have not been able to just sit still and watch the world go by. I have to be active. I read a book or quilt of now I even knit if I am just sitting. I am the person on the plane that has the light on (my apologies to those I annoy) through the whole flight because I am quilting, or knitting or working on something on my computer or maybe even reading a book. Since my diagnosis I have found myself just sitting and doing nothing over extended periods, especially now in the summer. It is one of the oddest things that I find myself doing anymore, odd at least to me. What I have learned though is that heat is even worse than just making my numbness in my legs worse or making it harder for me to think clearly. When I was first diagnosed I had a blown pupil (fully dilated) when I was about 30 days into P90X, which if you have seen the infomercial or done P90X you know it is a bit of an extreme workout. I was working out at least 1 hour a day, every day. Now I know that is not as extreme as you can get for a workout, but I was loving it. I was also back on my bicycle and back to running. The last time I went into the hospital it was after I purchased a total gym. I was 5 days into 1/2 hour workouts each day when I remembered that I had a working theory of exercise puts me into the hospital. So I stopped the workout plan and just did a little of exercise from then on, but within 3 weeks I was in the hospital. It has been long enough that I do not remember the hospitalizations in between, but I had to have had exercise linked to my hospital stays to have had that theory. After 3 or 4 experiences of going into the hospital because I had a new lesion or plaque build up in my head or spine it is no longer a theory for me. It is the way my MS works. If I exercise just a little, to the point that I get hot and start sweating, that is to much. What is the most difficult is I have always been active, running, swimming, hiking, walking, something, and now I sit and walk a little bit. My pedometer helps me know if I have walked too many steps in a day, not how many more steps do I need to take today. It is backwards and leaves me sad when I think about it. What is worse has been the weight gain. When I start working out, like P90X, I get my metabolism working at a higher rate. Then I go into the hospital and they give me steroids to shrink the plaque so that it will stop putting pressure on some nerve in my head or spine. Not just a little Z pack of steroids. IV based steroids that is a higher dose than even the nurses are used to seeing. That leaves me exhausted and I sleep a lot for the next few weeks. The signal that gives my body is that something horrible is happening so it better store fat for energy that can be burned later just in case. I have repeated that cycle 3 or 4 times in the last 7 years. SO… I gained a lot of weight and I cannot exercise to take it off. What is a girl to do? I looked for a diet plan like weight watchers but I could not find anything I could do because I am also gluten intolerant. Until last fall. My dear friend Mina Fies introduced me to the Healthy Weigh Now. What really had me interested in trying it was that it was completely gluten free! So I signed up. Since Oct 22 I have been eating about 800-900 calories a day with less that 50 grams of carbohydrates, which is not much food. It is cleverly crafted to put my body into ketosis which has me burning that fat that I kept storing up. So far I have lost 40 pounds all without exercise! It feels like a dream to me. I keep shrinking and shrinking and clearing my closet out of clothes that are too big. It feels amazing to know that I can wear any of the clothes in my closet with the only concern that they may be too big. It has taken dedication though. To have been on this diet through the holidays, Thanksgiving and Christmas, was tough. To watch the pumpkin pie or the pecan treats go by and not touch them was so tough. I did sample them, but only a tiny small amount on the end of a spoon. Less than a 1/4 teaspoon of any sweet. Knowing that next year I will be able to have some pie. Knowing that I will not be so embarrassed wearing shorts this summer. Knowing that my body will be healthier made it a little easier. I feel that I still have a long way to go but I can also see that I can get there, even before summer gets here again. My hospitalization last fall was because of a new lesion or plaque buildup on my spine which caused numbness starting in my toes and working its way up the back of my legs. Fortunately the steroids reduced the size of that plaque so that the numbness is almost all gone. Unfortunately I am left with quite a bit of pain and numbness in the bottom of my feet, especially when I stand or walk a lot in a day. The crazy part to that sentence is I now consider a lot of walking to be 5000 steps in a day. Just before I was put on those steroids I was up to an average of 10,000 steps a day. I am finding this to be a very unsettling change to my life. My dear friends, Amy and Millie, were in town weekend before last and on Friday the plan was to go downtown DC and do a tour of the Capitol and the Hirshhorn museum and who knows what else. My fear was not being able to walk that far. I was right to worry. Near the end of the tour of the Capitol, which was first, I could walk no more, and that is after taking a cab from the metro to the Capitol avoiding that walking. I just found a seat and told them to collect me on the way out. A taxi ride later we were in the Hirshhorn and I requested the use of one of their wheelchairs. A wheelchair. I requested the use of a wheelchair for myself. I have grown accustomed to working hard to get my parents into wheelchairs, but putting myself in one, well, that was tough. A few weeks ago I realized that I was resigned. Resigned to the fact that I will have constant pain in my feet forever. Now I know it may not be forever, but it may be. I may end up in a wheelchair sooner than I was thinking before. With that I am now having a very hard time doing my job… teaching. While I was teaching in the UK for 1.5 weeks I found out that I was heading to South Africa. 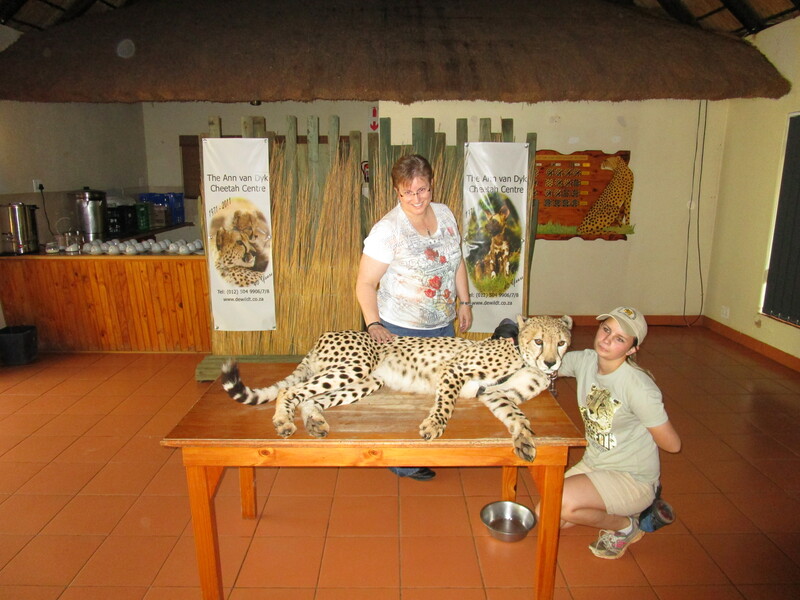 I ended up with just over a week there and had the fun of going to see Cheetahs and Lions! 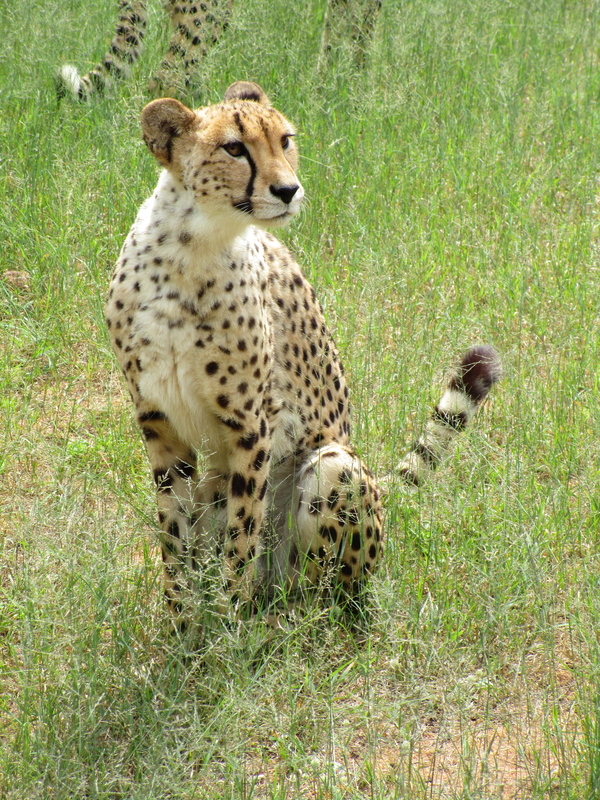 The first place I went was the De Wildt Cheetah Center. It was amazing to get to pet a cheetah. Softer than I expected! Ann Van Dyk has spent a good portion of her life bringing Cheetahs back from the edge of extinction. They are such amazing and FAST animals. 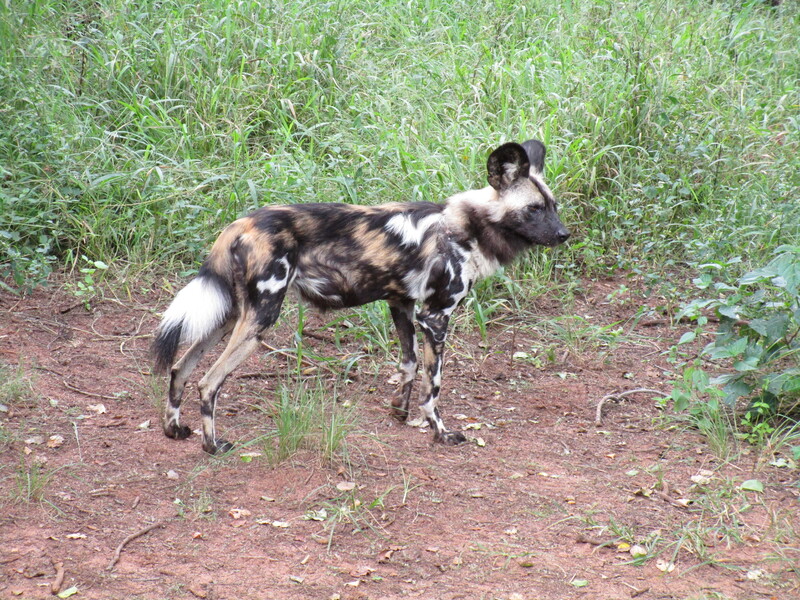 I was also amazed to learn that the African Wild Dog is nearing extinction as well. They have this crazy chirpy bark when they are hunting. I just keep wondering why they do not have a better name than just wild dog. Like big ear, or fluffy white tail, or chirpy dog… ? The Cheetah really is a beautiful cat! After the De Wildt Cheetah Center a trip to Ukutula was perfect. 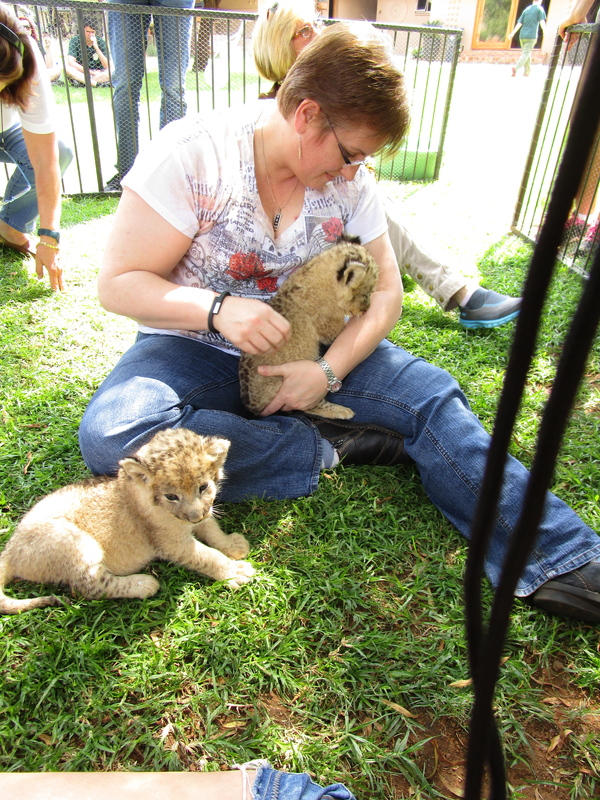 If I remember correctly Ukutula means quiet place in Zuni It was amazing to get to hold baby lions! These lions were about 4 weeks old. We then got to play with 2-3 month old. Then pet 5-6 month old as well as go for a walk with 1 year old! 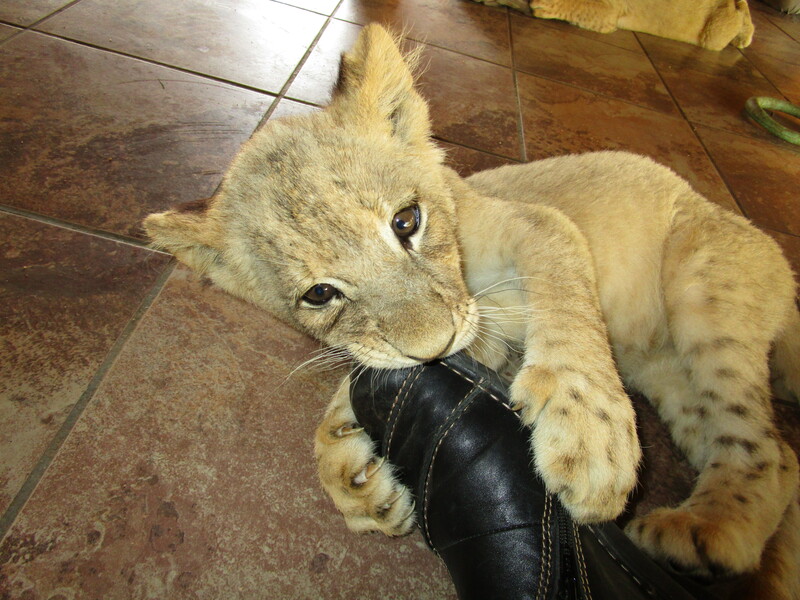 The 2-3 month old lions really enjoyed chewing on my shoes! What an amazing trip especially since I did not know that my trip to the UK would send me on to SA! It has. It has been a while since I posted anything. I have gone almost silent on line. I have my reasons, but mostly just fear of upsetting someone else. I keep upsetting people around me, and I have to admit I am a bit baffled. I have not upset anyone by way of yelling, being mean, denigrating, etc., nor does it even seem to need me to open my mouth. The year started so incredibly well. I finally live in Virginia again. I have been trying to get back home for 4 years. I was unable to get insurance in Virginia due to my MS and my coverage in Florida would be dropped if I moved. January 1st it happened. Thanks to Obamacare. I am home. It was one of the best things …. Then back into the classroom I went, and upsetting people. The conclusion I am currently at is this. I have been wanting to change my life for a long time so that I am not on the road so very much. I think the universe is simply screaming at me that it is time. Time for that change. No more excuses. No more “trying”. Change will happen. What change you ask? That I do not know, but change I must. There is not much I have ever wanted to do, except teach. So as I ponder what that means now on this very snowy March day in northern Virginia I will quilt. Mom passed Sept 29th of last year and she left a quilt top for my sweet little niece. I promised I would finish it by Christmas and I am now late although I am nearly finished! I have to admit that I feel that my body betrayed me. With MS it just does not behave the way it did and I don’t really like it. But somewhere along the way I betrayed my body. I will begin the work of changing that today. When I was diagnosed and put on such a large dose of steroids my weight went up. My B12 levels dropped dramatically and my weight went up further. I am now afraid to work out, so my weight went up more. I am starting a slow carb diet. I found it in the Four Hour Body by Timothy Ferriss who was featured on Dr. Oz. He seems to make sense from everything that I know so here it goes. Four meals a day, 6 days a week. Each meal to consist of a protein, a legume, and a vegetable. No bread, fruit, potatoes (or other white starches). On day 7, as he puts it, Dieters Gone Wild. This past weekend was a terrific event to raise money for awareness and research for Multiple Sclerosis in the WDC area. The event was Bike MS: Beyond the Beltway. My plan was to ride. So many things got in my way though. I could say that I was full of excuses, but I believe I made the right decision to be on the crew and support the riders. What was bizarre and shocking to me was to have a rider tell me I was a wimp, but even more shocking was the way. He lumped me and all other people that have MS into a single group of wimps. The weekend was quite warm and humid. I woke up quite worried, perhaps I could even say I was scared about the prospect of just being outside in that heat all day, and that was with the thought that I would not be riding. My body does not react well to heat, and when I say not well I really mean it. I am not used to being called a wimp. It is not a word that people have ever really used to describe me. I have to admit thought that this past year+ has left me very careful about being tired and overheating. Today is a nice comfortable day with minimal humidity. I just went for a 20 minute easy bike ride, and yet even that was enough to bring on the first of the reactions that I have. My head first feels like it is in a kind of vice. If I don’t pay attention and the feeling just gets worse. After that I feel even more tired. But it is odd, it is this all consuming, unavoidable, inescapable tiredness. Next I start to get dizzy. The kind of dizzy that you feel after you have had WAY to much to drink. The kind of dizzy where the world starts to spin and all you want to do is lay down. If that was not enough my eyesight then starts to go. It is not quite like I am blink, but I also get to where I cant really see either. Combine that with a possible broken rib from coughing so much for long because I have yet to learn my lesson. MS makes it real hard for me to clear any kind of infection without assistance. The hospital did not do an X Ray to save my body from any more radiation than necessary, but the doctor was able to tell me I had all of the same damage to the surrounding muscle that I would have with a broken rib. Combine that with an insane travel schedule that has kept me from being able to do any practice rides. And well…. I thought is safest to not ride, but rather work as hard as I could in support of the riders. I was still exhausted from just that and I was able to save energy by working inside all day. On Saturday I left the ride early because I had gotten to the point of the world spinning on me. I sat and rested for a little bit until it was safe to drive, then I went home to bed. So I guess what I want to say is that if you know someone that has an illness of some kind walk a mile in their shoes before your judge them. Please. I am learning how to manage my tiredness. I am working to learn to manage my overheating. Other than staying in the AC all the time that is. This will not stop me. I do plan on riding next year. I just have to figure out how….